Happy Manic Monday! Hopefully everyone had a nice relaxing weekend. Too help me overcome my cold, I binged on soup all weekend, specifically noodle soups like tonkotsu ramen(not from the bag) and chicken pho. That's my kind of comfort food! Today I might try to make some chicken pozole - I haven't made it in quite a while and nothing beats the yummy chicken broth with hominy and a squeeze of lemon. I'm already drooling thinking about it. I have another new to me brand today, and that's GlitterDaze Can't Have Your Brains And Eat 'Em Too. This is clearly a Halloween themed polish, but I think the colors work for any time of season because it doesn't resound with your typical Halloween colors like black and orange. Instead, this is a dark green jelly jammed with colorful glitters like gold, fuchsia, green, and a tiny bit of orange. The glittery goodness sparkles like mad and it took two coats for the results below. The base is still a bit sheer for my liking but I felt that there was plenty of glitter on the nail. The formula didn't clump or pool, and it applied incredibly smoothly. 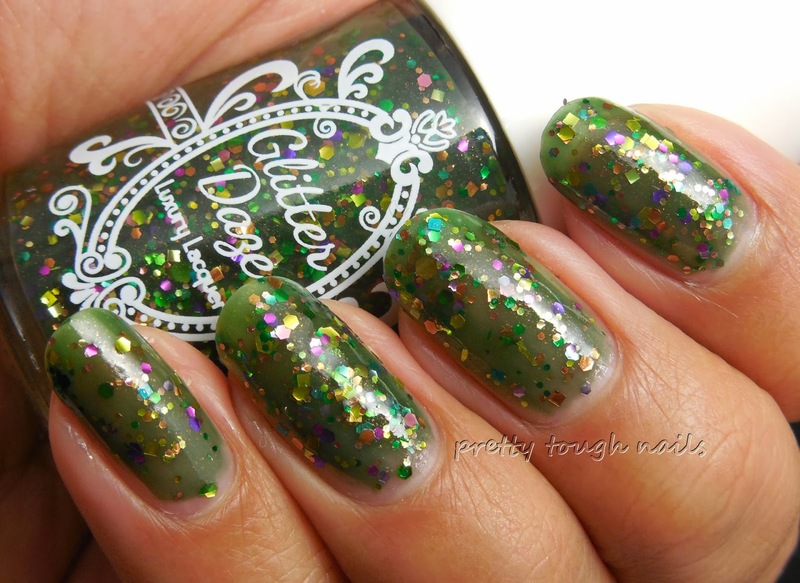 To finish, I used GlitterDaze's fast drying topcoat. I'll post a review on that later once I test it out more. I really love all the colors and sizes of glitter within this polish, and the shade of jelly is straight up my alley. 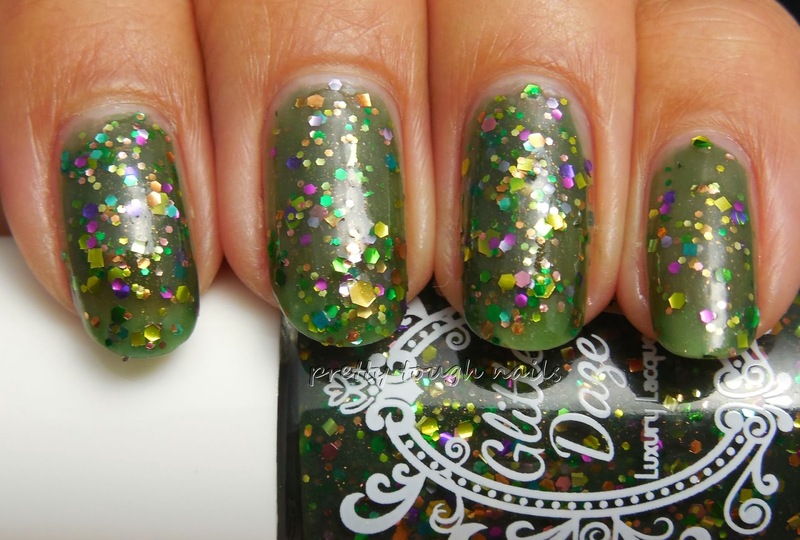 For a Halloween polish, this can be easily be pulled off for Christmas or spring. 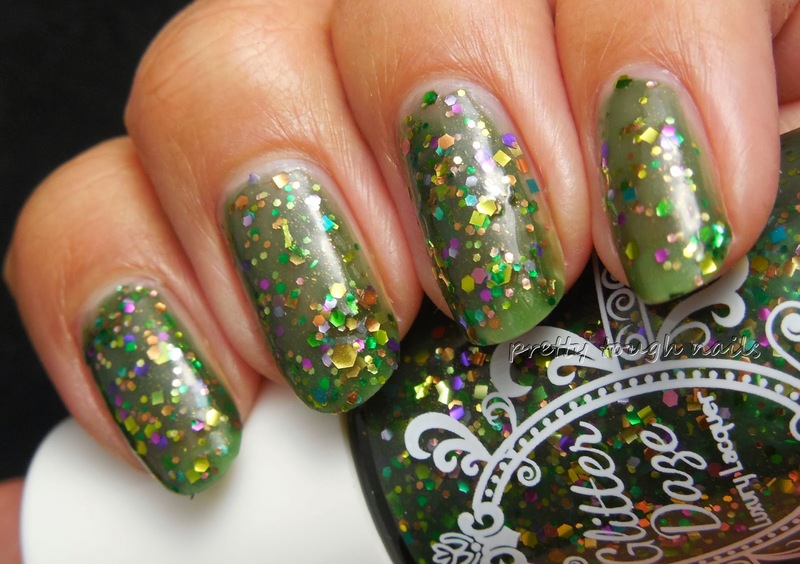 It did remind me of another green jelly glitter that I own, and that's My Ten Friends Clusterfrak, a polish that made it into my 2013 favorites. Is it any wonder that I gravitated towards this beauty by GlitterDaze? Do you do that, buy a polish that is similar to what you already own? Who am I kidding, of course you do! This is awesome! 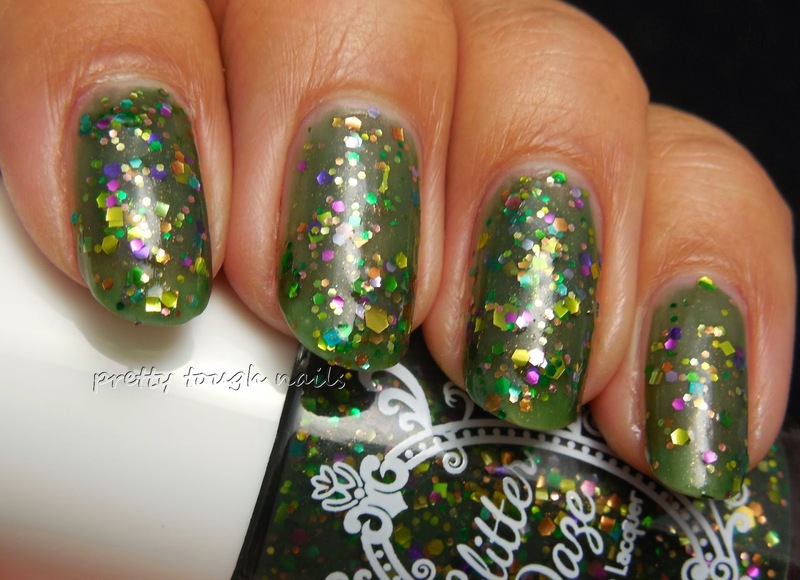 I love how unique the shade of green is and those glitters are super pretty too. I try not to buy polishes that are too similar but sometimes it's inevitable when you own so many. I think Clusterfrak and this one are different enough to justify owning both though.